Public concern about the spread of the Ebola virus in the U.S. has increased since early October. Currently, 41% are worried that they themselves or someone in their family will be exposed to the virus, including 17% who say they are very worried. In a survey two weeks ago, 32% worried about exposure to Ebola; 11% said they were very worried. Most people (58%) express little or no concern about becoming exposed to Ebola, though that is down from 67% in early October. And majorities have at least a fair amount of confidence in both the federal government and U.S. hospitals to deal with the disease. The latest national survey by the Pew Research Center, conducted Oct. 15-20 among 2,003 adults, finds that 54% express either a great deal (18%) or fair amount (36%) of confidence in the federal government to “prevent a major outbreak of the Ebola virus in the U.S.” This is little changed from early October, when 57% had a great deal or fair amount of confidence in the government to prevent a major Ebola outbreak. About six-in ten Americans (61%) have a great deal or fair amount of confidence in U.S. hospitals “to diagnose and isolate possible cases of Ebola,” while 38% have little or no confidence. However, just as relatively few people (18%) express a “great deal” of confidence in the government to prevent a major Ebola outbreak as have a high degree of confidence in hospitals to diagnose of isolate Ebola cases (16%). Meanwhile, the U.S. military’s efforts to address the spread of the disease at its epicenter draw widespread public support. Nearly eight-in-ten (77%) favor the U.S. sending military troops, food and medical supplies to West Africa to combat the spread of the virus in the region. The survey finds that Ebola news has registered widely with the public – fully 98% have heard at least a little about the current outbreak of the virus. And nearly half of Americans (49%) say they are tracking news about Ebola “very closely.” That is 20 points higher than the share following news about U.S. airstrikes against ISIS in Iraq and Syria very closely (29%), and more than 30 points higher than the percentage paying very close attention to the midterm elections (16%). In general, the public trusts information about Ebola provided by local hospitals and health authorities, the Centers for Disease Control (CDC), and the news media. About six-in-ten (62%) have at least some trust in information provided by local health authorities, 58% trust information from the CDC, and 57% say the same about news organizations covering Ebola. 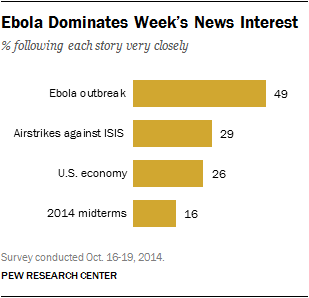 Since early October, worries about Ebola exposure have increased across most demographic and partisan groups. But the rise in concern has been particularly striking among Republicans. In early October, 33% of Republicans were at least somewhat worried that they themselves or a family member would be exposed to the Ebola virus (7% very worried, 26% somewhat worried). Today, nearly half of Republicans (49%) are worried, with 16% saying they are very worried and 33% somewhat worried. There has been less change among Democrats – 36% now have at least some concern about personal exposure to Ebola, compared with 30% in early October. The partisan gap in Ebola worries, which was negligible two weeks ago (three points), has increased to 13 points in the current survey. Among demographic groups, concern about the Ebola virus continues to be higher among women than men; currently, 48% of women are at least somewhat worried about becoming exposed to the virus compared with 34% of men. And as was the case in early October, minorities and people with less education are more likely to be worried about Ebola than are non-Hispanic whites and college graduates. Republicans also continue to express less confidence in the federal government to prevent a major Ebola outbreak. Currently, 42% of Republicans have a great deal or fair amount of confidence in the government to prevent an Ebola outbreak, compared with 67% of Democrats and 51% of independents. These figures are changed little since early October. There are only modest demographic differences in confidence in the government to prevent an Ebola outbreak. Women (52%) express nearly as much confidence as men (57%) in the government to stop an Ebola outbreak, and there are only small differences in opinions across racial, educational and age categories. While Republicans have far less confidence than Democrats in the federal government to prevent an Ebola outbreak, they express about the same level of confidence as Democrats in U.S. hospitals to diagnose and isolate possible Ebola cases. Majorities of Republicans (61%), Democrats (66%) and independents (54%) have at least a fair amount of confidence in U.S. hospitals to diagnose and isolate Ebola cases. By about four-to-one (77% to 19%), the public favors U.S. efforts to combat the Ebola virus in West Africa, including the dispatch of U.S. military troops and food and medical supplies to the region. Support for the U.S. actions to stem Ebola’s spread in West Africa span partisan and demographic categories. Majorities of Democrats (85%), independents (76%) and Republicans (70%) support U.S. efforts to combat the disease in West Africa. The public has some degree of trust in information they are getting about the Ebola outbreak from a variety of sources. A separate survey, conducted Oct. 16-19 among 1,000 adults, finds that majorities have at least some trust in the information they are hearing from local hospitals and health authorities (22% a lot, 40% some) and the Centers for Disease Control and Prevention (22% a lot, 36% some). 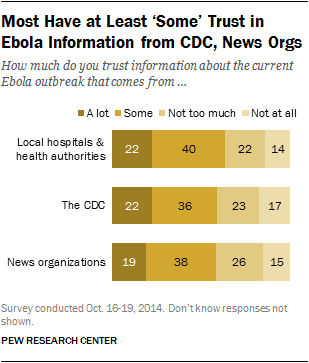 Most also trust the news organizations covering Ebola at least somewhat (19% have a lot of trust, 38% have some). Democrats are more likely than Republicans to trust the CDC’s information about Ebola While about two-thirds of Democrats have some trust in Ebola information from the CDC (68% vs. 30% with less trust), Republicans are divided (50% at least some trust, 49% not much or at all). And one-in-three Democrats (33%) have “a lot” of trust, compared with 15% of Republicans. Democrats also place more trust in news organizations covering the outbreak (72%-26%); among Republicans, 54% have some trust and 45% do not. Roughly half of the public (49%) very closely followed news about Ebola last week, a far greater share than interest in news about ISIS airstrikes (29%), U.S. economic news (26%) and the upcoming congressional elections (16%). Overall, last week’s Ebola interest ranks it near the top of the year’s closely followed stories. On the topic of Ebola, there is only a modest age difference in news interest. While 56% of adults 65 and older very closely followed news about the outbreak, 37% of adults under 30 also tracked it closely.